Probably the last thing a gardener would want to do is kill off a beneficial insect, like the milkweed assassin bug, that is controlling pests ( flies, mosquitoes, caterpillars, cucumber beetles, the Asian citrus psyllid, aphids, army worms, and other prey 6x their size). The milkweed assassin bug is the common predator that is effective in our landscape and vegetable gardens. 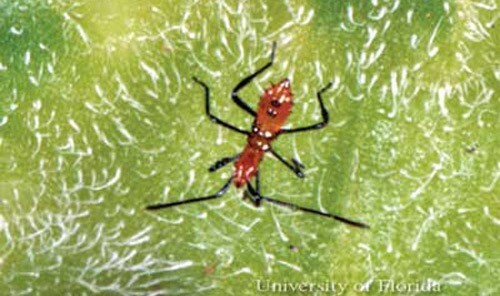 Therefore its similar identity in the nymph stages to leaf-footed bug nymphs needs to be distinguished. From looking at the above photos, the casual observer probably will not be able to distinguish between the two nymphs. The juvenile insect in the top image will attack apples, blueberries, blackberries, cowpeas, cucurbits, eggplants, okra, tomatoes, pecans, hibiscus, etc. The MW assassin bug nymph in the bottom image is a desirable predator to have in the garden. Therefore you would definitely not want to bring out a broad range pesticide to kill what may or may not be a harmful bug, unless you are certain of the identification. There are a few behavioral characteristics that may help. 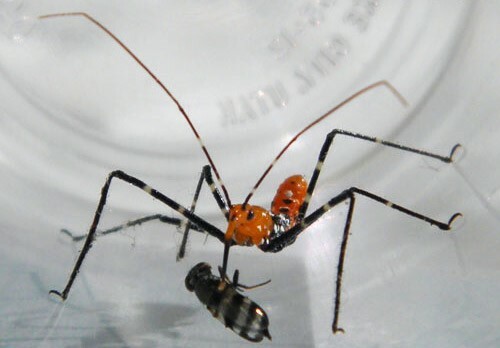 The assassin bugs are usually loners that are observed sneaking up and “assassinating” their prey. If you get near them, they may rare-up on long thin legs and extend their proboscis (nose) forward. Also carefully observe the surrounding vegetation for assassin bugs that have captured prey. Their proboscis has injected digestive enzymes into the prey for liquefaction, which does take time. Handling the latter nymphs and adults can result in a nasty bite. So, be careful in capturing these bugs for children. 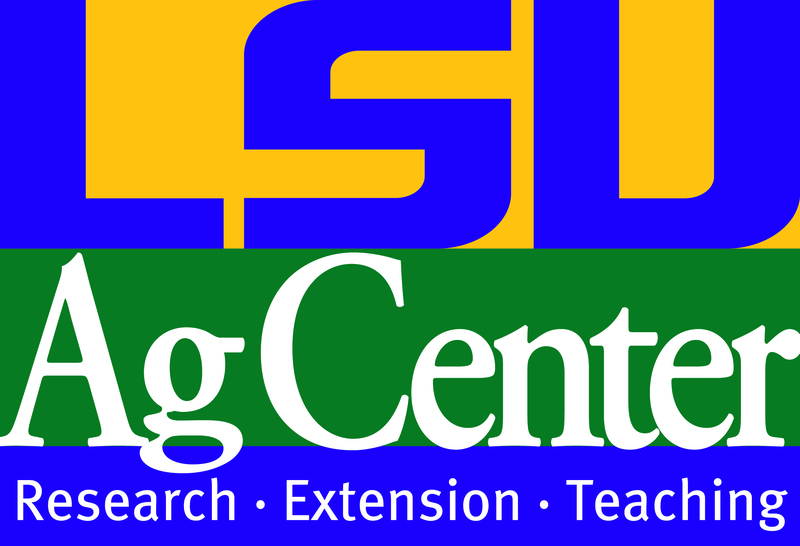 A positive ID at the LSU AgCenter is recommended. The preferable method is to take a close-up photo with a digital camera or a newer cell phone. The nymphs of the leaf-footed bugs usually stay together to attack plants in packs that may include adults, and other pest-bugs. A joint pest-effort in overcoming the plants defense system is typically seen on unhealthy plants. The proboscis will be kept under the belly of the bug. It never goes forward like the assassin bug’s exhibit. The message is to make an effort to ID and keep the beneficial bugs, for they are the balance in the ecosystem of your garden or ornamentals. Killing all bugs in a wide-spread area throws this system out of balance in favor of the pests that have the quicker and more abundant reproductive cycles.